Gradient and unique geology are the primary ingredients for creating great whitewater. Chattanooga has both of these in abundance. Some downright steep streams are formed by the same series of plateaus and escarpments that the city is famous for, and for a select group of elite whitewater addicts, paddling in Chattanooga has been a pastime for decades. Why? Because it’s home to some of the best quality whitewater creeks and streams in the world. And while beginners and intermediates can certainly discover some great places to cut their teeth, it’s the experienced paddlers who come to this city and never leave. So whether you’re a local finally looking to dip your toes in the sport, or a traveler who’s visiting specifically for the boating, you’ve still got time to get out on the water and catch some world-class rapids and waves. Here, a sampling of some of Chattanooga’s finest whitewater paddling options, guaranteed to turn your time in the city into an outdoor adventure you’ll never forget. The Ocoee River is one of the most popular rivers in the world, seeing hundreds of thousands of kayakers and rafters every year. This popularity is well deserved, as it has about 10 miles of excellent class III-IV whitewater, as well as a positive relationship with TVA that keeps the water flowing for weekend warriors all summer long. 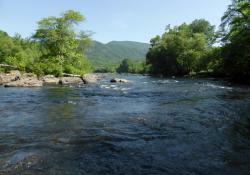 There are two separate Ocoee whitewater sections to paddle (Middle and Upper). Both of these sections are notorious for continuous and exciting class III-IV rapids. Spilling down the Ocoee River&apos;s congested streambed, TVA&apos;s scheduled recreational water releases combine to make the Ocoee the most popular commercially rafted section of river in the US, with over 200,000 rafters putting in each year. The Ocoee is dammed and controlled, with guaranteed releases five days per week, allowing paddlers to enjoy a long season from March until October. Find the Ocoee River release schedule at TVA&apos;s website. 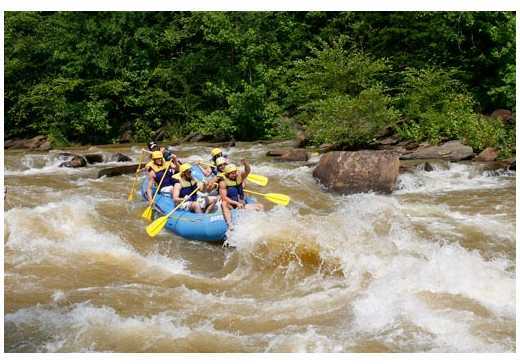 Ocoee Outdoors, Outdoor Adventure Rafting, Ocoee River Rafting, Raft One, and Quest Expeditions all offer guided trips where they take care of all the details—you just need to show up. 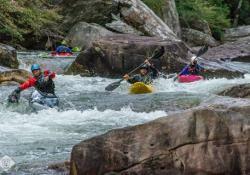 The Hiwassee is a gorgeous, Class I-II river that offers great, laid-back paddling. The beauty is incredible. It is a dam-controlled river and thus has guaranteed releases, which gives it a long season. The Ocoee may be a bit tougher, but the Hiwassee offers beginners, and those seeking a more peaceful river, an excellent paddle with unsurpassed beauty. The Hiwassee River is large and wide along a popular section for novice whitewater paddlers who make the voyage in kayaks, canoes, duckies, and tubes. The combination of splendid scenery and easy class II whitewater makes it a favorite river for family float trips, beginner paddling instruction, and most recently, stand-up paddleboarding. Water is released from the Appalachia Dam year round, allowing the Hiwassee to be enjoyed in all seasons. Summer weekend visitors will find themselves cooling off with plenty of company and commercial traffic. In the cooler months, however, a trip down the Hiwassee can be quite serene. Two units is always the preferred release for the best level. Find the water release schedule here: TVA.gov. 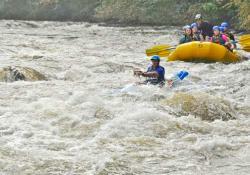 Ocoee Outdoors and other local outfitters offer rafts, inflatable kayaks, sit-on-top kayaks, and tubes to take down the 5.5-mile section of the river. Stunningly tucked into the side of Walden’s Ridge, concealing over 75 class III-V rapids in 12 glorious isolated miles, North Chick is the classic benchmark and staple of Chattanooga&apos;s best quality whitewater. A few of the bottom rapids (III-IV+) bordering a trail at the canyon mouth are easily accessed, and frequently boated by locals for afternoon amusement.